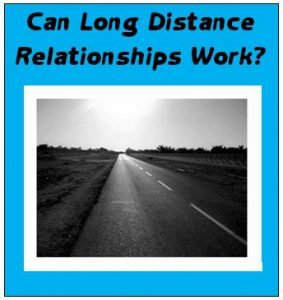 Can long distance relationships work? This is a big question without a simple answer. Here’s my dating advice. I am chatting with a guy and we already met. He flew all the way from Canada to Lisbon and he sponsored my ticket too. After meeting his interest was not the same level anymore. He gave an excuse that he might be busy with work. I like him but, I can’t understand how he lets the days pass without messaging me. I always initiate the conversation and throws out questions just to keep the conversation going. Sometimes I feel like giving up with this long distance thing. I don’t know what is wrong with him. He doesn’t say anything but I feel bad that he is ignoring me. I don’t know where I went wrong too. Sometimes I feel maybe I am too honest with my feelings and giving myself away so easily. Am I just being paranoid or maybe I don’t understand men in general? I feel that if I mattered to him, he could have found a little bit of time for me. All I need to hear from him is closure for this. But what if he is just really busy and messaging him will blow this away? Please tell me what to do Ronnie. When you meet a man you really like, hit it off and then things sort of dangle there in limbo, wow that’s hard. If he doesn’t stay in touch you are left hanging and wondering which is emotionally draining to say the least. So asking, “Can long distance relationships work?” this lack of communication makes it almost impossible. Almost every day I get emails from women all over the world who are stressing and asking can long distance relationships work. Sometimes they’ve met and other times they’ve communicated for months or longer but haven’t met in person. This is such a huge problem for so many single women. You’re communicating with a man who lives in another state or country and you decide to meet. You might both fly somewhere in between or one of you flies to the other’s location. How exciting! Meeting a stranger (even though you do know something about him) is the height of romantic adventure! Keep in mind this is highly romantic for him too. Some men adore women and romance and really enjoy flying off to meet you. Does that mean he wants a long-term, long distance relationship? Nope, not at all. That’s an entirely different matter. Time together might have been fabulous, but there’s nothing saying he wants to see you again. Men like romance too. They like the excitement, the adventure and the fantasy. Just don’t mistake this for a prelude to a lasting relationship. Long-distances relationships can work when both people are equally committed. The distance matters less when you have some foundation and time together before the distance comes into play. Keeping love alive when you are out of sight is hard work. Since you only met once, there is no commitment. He’s not committed to you, to exclusivity or to making your connection work. You barely know him having spent so little time together. And he’s already pulling away and being unresponsive. His behavior is NOT indicative of a man who is serious about you. You’ve been doing ALL the work to keep the relationship alive. But that doesn’t seem to help. You are right – IF YOU REALLY MATTERED TO HIM, HE WOULD MAKE TIME FOR YOU. That’s your evidence he’s not committed or into you enough to do his part. Many women have a tendency to reach out more when a man pulls away, but that is not a good strategy. The more you lean in to connect the more he backs away which is why I recommend against being the one to initiate at the start of dating. You can’t know what he’s thinking so it’s best to let a man prove himself to you. This guy is proving that he’s not the right guy or he would stay in touch. You also asked about being too honest with your feelings. This is another place where you don’t want to be lopsided. That’s why letting a man express his feelings first is a better strategy. This makes things go more smoothly than when a women reveals her feelings first. Give him room to lead the way. Letting him know how much you care too soon makes a man feel uneasy and pull away. When he’s sure you like him that’s not nearly as exciting as if he had to work hard to win you over. We all want what we can’t have or what’s not easily attained. Call it human nature. I can’t say if that’s what happened here – he might just not want a relationship. When a man tells you he’s busy, that’s his way of saying, “Don’t expect anything from me. I’m not that interested to make time for you.” It’s like some secret code men have, thinking that will hurt your feelings less than the truth. Other excuses from the “man code” include sudden illness, family issues, a difficult boss, problems at work, and big projects needing his attention first. All these things are a man’s way of saying, “You are not my priority.” They are emotionally unavailable men who turn to excuses women wouldn’t consider arguing with since they sound valid. Often men try to push you away thinking you’ll get the hint and stop bothering him. Okay, this is delicate but, I have found this to be true at times. Is there any part of you that fears a close relationship? Sometimes it’s easier to fall for a guy at a distance since he won’t take up too much of your time. He can’t crowd your style or influence your decisions. He’s too far away. Long distance relationships can work well for two people who don’t have much time and want something real but limited. For example, two busy professionals who travel a lot. Many times women don’t even realize they are not really emotionally available either. If you date men who are not completely available, it might be worth looking within to see if that is also true of you just in case. So in answer to the big question, “Can long distance relationships work?” my response is…sometimes. If there is a foundation, the man continues to pursue you, makes plans and visits, then he is demonstrating genuine interest. But I’m so sorry to say in this case I don’t think so. Looks like you had a romantic fling which isn’t a bad thing at all. Let go and look for a local man. Someone within an hour or two of where you live. Make your life easier and date geographically desirable men – its just a smart thing to do. Ready to get past your confusion about men and dating? Great! Get my free book His Mixed Signals Are So Confusing! Find Out What He Really Means and subscribe to my newsletter too. Hi Naomi – it’s never too late to value yourself! Take this experience and grow from it. Recognize a dead end earlier so you can avoid wasting too much time on the wrong men. If you need help identifying the wrong men, my book Is He The One? on Amazon does just that, explaining all the games men play and it’s just $3.99! Thank you, I kind of expected that reply, as women with such low self esteem we so want to be loved we just take crumbs of affection and think it’s the be all and end all. I am sad as I had hoped it would develop, I seem to attract the wrong sort and it’s my own fault for not valuing myself. Hi, really interesting read. I think it explains a lot as well. Hi Atria, This might be hard to hear, but it sounds like your boyfriend wants a one-way relationship. Everything is cool so long as you don’t ask or expect anything of him. He withdraws because you said you missed him? Why would a man who was in love with you punish you by shutting you out? That’s not how a man in love behaves. He is self-centered because your feelings DO matter and you need to feel safe to express them. Time to re-evaluate if this is how you want to be treated. Life is too short to suffer in a NEW relationship with a man who treats you this poorly. Things like this don’t get better, they often go downhill. I hope you decide you deserve better and free yourself up to find a better man. I met a guy online and we have been together for 4 months now. Things are good. One time i told him that i feel you are losing interest, he withdrew and told me I am insecure and he doesnt like insecure people. We usually kiss and make up. This week, i told him missed him and i missed him teaching me photography lessons bec he went to the beach. He got upset and said your lessons are most imprtant than my rest? I said thats not what i mean. I just miss spending time with you. He has been hot and cold the past days even after i apologize. I am afraid to ask him whats wrong because he might leave me but I dont like it that he is hot and cold ? What do i do? ?.